To be able to reproduce the base notebooks in Swift it would be great to be able to export marked cells in a module that we then import at the beginning of the next notebook (as is done in the python notebooks). @marcrasi pinging you if you have any idea on how to do that. Also, if there could be an easy way to time a cell (like the %time magic in jupyter) that would be super-cool. 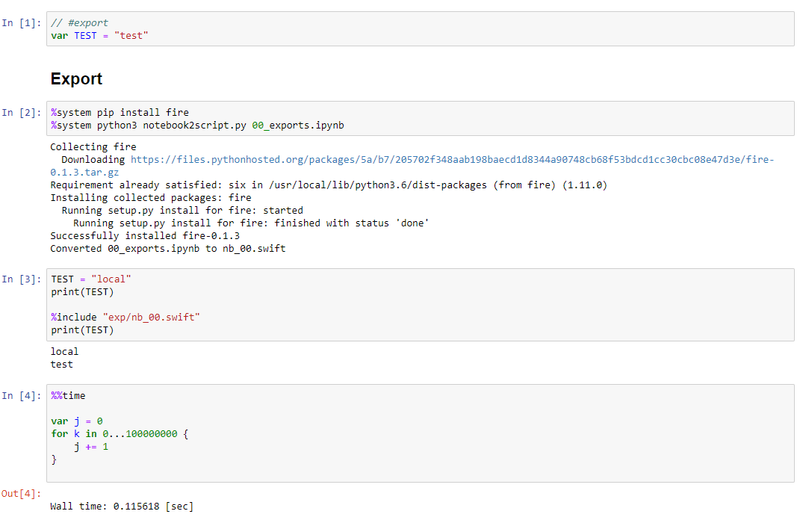 Also it might be handy to run shell commands via “!” like in IPython? This is with custom hacks to Swift jupyter kernel to add %%time and %system commands, and also notebook2script.py have to be updated. The downside of using %include is that it executes the code in the same namespace, this may lead to side effects, e.g. if variable names overlap (as you can see on the screenshot). Better option might be using import like described here https://forums.swift.org/t/import-swift-file-in-script/9429/9 but I couldn’t make this work, though. It seems that Swift does not need explicit import's when files are located in the same xcode project, but I’m not sure how to achieve this behavior in Swift REPL, which is running in jupyter kernel. I know how to do all of this in python, but the idea is to only use python when absolutely necessary (matplotlib for instance) and Swift for all the rest. Oh interesting, do you mean also re-writing notebook2script.py that parses out cells code from .ipynb, to Swift? Timing function can be implemented in Swift and imported or included in Swift notebook for usage, but this will probably be not as convenient as %time magic command (e.g. you’ll probably need to wrap your code in a lamda function and pass it to timing function?). It would be interesting to see if it’s possible to add timing directly into Swift REPL. In my case I measure the time in Swift jupyter kernel before and after the cell code is sent to Swift REPL, it might be not as accurate as measuring inside Swift. Rewrite it in Swift and package it up as a SwiftPM package so that it can be imported with %install. This looks pretty easy because it’s just doing some JSON parsing and some file writing, and there are Swift packages for all of that. Instead of outputting a single script, output a SwiftPM package structure so that the exported thing can be imported with %install. Then you’ll also have to remember to make public declarations in your // export cells because those will be the only things visible when you import the compiled module. We could provide a quite nice timing API in pure Swift using closures. e.g. // Could do fancier pretty-printing logic based on the order of magnitude. // Run it a few times and calculate mean and stdev. I think that both the exporting and timing should be possible to implement right now without any changes to swift-jupyter. Yup that’s perfect. I have something like that in BaseMath already, although it would be better to have it somewhere else . @Kaspar You could do it this way and then have access to whatever values you need without having to deal with return values. Yups that’s what I do. Rewrite it in Swift and package it up as a SwiftPM package so that it can be imported with %install . This looks pretty easy because it’s just doing some JSON parsing and some file writing, and there are Swift packages for all of that. Instead of outputting a single script, output a SwiftPM package structure so that the exported thing can be imported with %install . Ok, I’ve done a few steps to do just that, and it roughly works. The good thing is that by putting all the packages we want to use in the dependencies of what I called FastaiNotebooks, we only need to install that in the first cell of the notebooks. Having the second package converted as an executable that works properly is proving a little bit more difficult, but I’ve probably done something dumb. Also, in the 00 notebook, MnistDataset::init, I had to replace path.mkdir() with path.mkdir(.p) so it doesn’t fail to create full path. I couldn’t build Notebook2Script as executable, but when changed to library (making func public) it can be %install'ed. And then running import Notebook2Script; notebook2script(fname: "00_load_data.ipynb") from notebook works as expected! Oh I didn’t think any of this would work on Windows, so I’m glad to hear you had very little to change! Yes, making this a library worked for me too, I don’t know what I messed up for the executable thing. I also got this, and found a workaround: https://github.com/fastai/course-v3/issues/64#issuecomment-434501646 ! From the rest of the thread, looks like getting a newer version of Jupyter would also help. It looks like our time never got defined, and it’s trying to call one defined in Glibc that takes an argument of type UnsafeMutablePointer<time_t>?. (Unfortunately, installing packages currently imports all of Glibc, which is why these weird functions are appearing). I tried your matmul notebook myself, and the time cells worked for me. The MnistDataset cell didn’t work for me, so I manually initialized some matrices and then ran time time cells. I think I had same error because it could not create path with path.mkdir in MnistDataset::init when you run it for the first time. It worked after adding .p option in path.mkdir() command in MnistDataset::init. Thanks! Bumping notebook version to 5.7.6 in swift-jupyter requirements.txt fixed the problem. And this also fixed annoying problem with not picking --NotebookApp.custom_display_url option (it was displaying URL with 0.0.0.0 before). And there was no problem with time function this time too. Yeah, I didn’t check if there was a ‘~/.fastai/data/’ dire before trying to create ‘~/.fastai/data/mnist_tst’ so that’s probably the cause of the error.